The pillow brought out the color in my room with the giraffe theme. 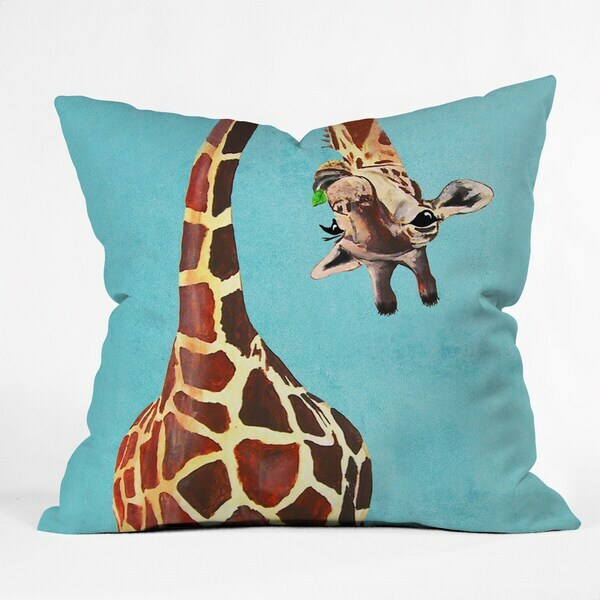 Mix in a wildlife element with this giraffe-themed throw pillow. Made with a durable polyester cover and polyester filling for softness, this throw pillow cushions your lumbar, neck, or head in chairs, sofas, and beds. This pillow is well made & comfy. It looks so good in my giraffe-themed bedroom! My new favorite pillow!! I adore the whimsical feel of this curious giraffe. Fabric is good, pillow sturdy. I’m happy with my purchase. Really cute. I bought this one and the other matching one in the series for two twin beds. Adorable ! I couldn't be more in love with this pillow. Very bright colors, cheeky print and plump. Looks wonderful on my chocolate colored sofa. Bought for my friend. Shw loves it. So cute and will cheer up anyone.